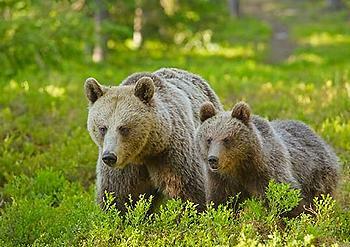 VIENNA, Austria, March 7, 2012 (ENS) – There are no more brown bears to be found in Austria, say European wildlife conservationists, despite the fact that neighboring Slovenia has a stable population of about 400 bears. The bears in the Northern Limestone Alps originate from a WWF Austria augmentation project that released three bears in the Northern Limestone Alps between 1989 and 1993. The location was chosen because one single male bear named Ötscherbär had naturally come to the area in 1972. Between 1989 and 2010 at least 35 bears have lived in this region. “WWF Austria was working more than 20 years on this project to bring back bears to Austria and to the Alps. One reason why we failed was poaching, more than 20 bears are missing. But another reason was the small founder population,” said Pichler. The brown bear population in the border triangle region between Austria, Italy, and Slovenia is connected to the large population of bears in the Dinaric Alps. Bears, mostly young males, disperse from the core southern Slovenia area toward the Alps. The numbers of bears that reach the Alps is dependent on the Slovenian hunting regime, conservationists explain. Over the past 10 years Slovenian hunting quotas have risen because bears have created conflicts with beekeepers and stockbreeders. Nearly 14,000 brown bears now live in Europe in 10 separate populations from western Spain to the Russian Far East and from the north of Scandinavia to southern Romania and Bulgaria. In France, bears are critically endangered. There are few wild bears in Central Europe and none on the British Isles. WWF Austria, Italy, Germany, Switzerland and France are working on a Brown Bear Conservation Strategy to be published within the next three months. The return of large carnivores to Europe is being held back because of three countries – Austria, Hungary and the Czech Republic – European Wildlife said in a statement today after comparing the wildlife in these three states with that in adjacent countries. Those three countries form a boundary beyond which the key species are not able to advance, European Wildlife has concluded. In Hungary, for instance, there are no bears, while Hungary’s eastern neighbor, Romania, has a population of 5,000 to 6,000 bears. North of Hungary, in Slovakia, there are 800 bears. Wolves are in a similar situation. In the Czech Republic there are only five to 10 wolves and their population is not growing, even though in Slovakia there are about 180 wolves, in Germany about 120 wolves and Poland has 800 to 900 wolves. Dostal called Austria, Hungary and the Czech Republic “the worst countries in Europe” for wildlife conservation. “In these regions, biodiversity, and mainly large carnivores, are getting lost like the ships in the notorious Bermuda Triangle,” he said. Such a dramatic decrease of biodiversity cannot be explained by economic differences among the three countries, he said. The living standard of Slovenians is higher than the living standard of Czechs, but Slovenia has more bears. In wealthy Germany, Europe’s most advanced economy, the population of wolves has doubled over the past two years. Nor are climatic conditions the reason for the decrease in population of key species, Dostal says. 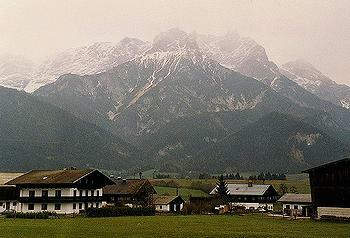 Although Austria is more mountainous than Slovakia, the bears in the Austrian Alps have become extinct. Austria, Hungary and the Czech Republic keep failing in their fight against poachers of bears, wolves and lynxes, says Dostal, who blames police for the fact that a majority of poachers flee without being apprehended and punished. Establishing a more efficient police approach for investigating poaching and increased punishment for poachers would help wildlife recover, Dostal says. “We want to look for other causes together with local conservation organizations in Austria, Hungary and the Czech Republic. Our aim is to find a common strategy which would erase the black triangle of biodiversity from the map of Europe, says Dostal. In the meantime, European Wildlife says the establishment of non-intervention zones in local parks and in at least 75 percent of the national parks in these three countries could help. Functional wildlife corridors could be created between the national parks and other protected areas, including trans-boundary areas. A project of the European Centre of Biodiversity which is being established by European Wildlife on the borders of Austria, the Czech Republic and Germany should bring back some extinct species such as European bison, he said. Dostal says improving the situation for wildlife in Austria, Hungary and the Czech Republic could lead to reversing the loss of biodiversity across all of Europe.